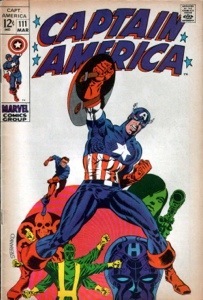 Instead of doing something productive, I’ve been brainstorming ideas for my costume for the Avenger’s Half Marathon in Nov. This first idea probably involves the least amount of work. The core piece is this Under Armour T Shirt. Kinda spendy at 45$, but not so costumey that it couldn’t be worn again. Next, I’d make an a-line running skirt out of this Lycra. 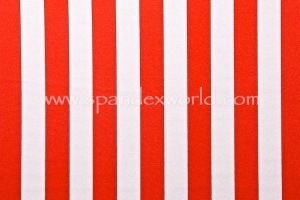 The stripes are one inch wide, so I think it would have an ‘American flag’ look to it, although wider stripes might be even better. 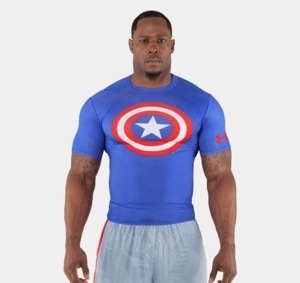 I’d layer black Lycra shorts under the skirt, white compression running sleeves with red mitts, maybe add red compression calf sleeves (here’s a great resource for custom running sleeves) and a blue visor with a big, white “A” on it. Good to go!